No, I did not just sneak off to Italy without telling you. I haven’t even acquired any new Italian cookbooks recently. It must just be something about the current combination of very un-Scottish summer heat and the sticky-sweaty stupor it induces that compels me to look to other sun-soaked destinations for culinary inspiration. As you know, it started last week with gelato. But not content to leave Italy after only one course (even if it was dessert), I’ve decided to linger a little longer and at least enjoy something typical of the other end of an Italian summertime meal. What I found myself craving was the famous sweet-salty and heart-breakingly delicious combination of prosciutto e melone, which is just really the fancy Italian name for cured ham and melon. It seems like a deceptively simple dish, but like a good gelato, it’s easy to do it wrong. Too many times I’ve had melon that wasn’t quite ripe, and prosciutto that was hard and stringy or overpoweringly salty. The prosciutto in particular is where restaurants often skimp, substituting cheaper versions that lack the complexity and texture of the premium stuff. Real prosciutto di Parma is salt-cured and air-dried for up to eighteen months before sale, resulting in a delicacy that while not cheap, embodies the very essence of ‘slow food’. And when prosciutto e melone is done right, it’s a nothing short of a revelation: rindless wedges of ice cold, impossibly sweet summer melon, each swathed like a newborn baby in folds of butter-soft and nutty prosciutto, tender and supple enough to eat with a spoon. Nothing else adorns this dish because nothing needs to; the components complete each other like yin and yang, bread and butter, barbecue and beer. That said, I’ve always believed food should be fun, and sometimes there is no bigger thrill than taking something sacred and turning it on its head. I saw a recipe for a salad similar to this one in a food magazine which attempted to play on both the common melon-feta affinity and the prosciutto and melon taste marriage. I tried it out and found it to be too overwhelming – the melon’s subtle perfume and sweetness was bullied into imperceptability by the saltiness of both prosciutto and feta. The second time I tried it I kept the prosciutto but axed the feta in favor of a soft mild goat’s cheese, which changed everything. It’s a delicious study in contrasts: the cold juicy melon, the creamy soft cheese, the crisp salty prosciutto, and everything enhanced by a sweet and tangy balsamic-honey vinaigrette. I’ve even pulled an Emeril and ‘kicked it up a notch’ with a little sprinkle of spicy chili. It certainly won’t replace the original, but it makes a refreshingly different and altogether mighty fine alternative way to beat the heat. Halve the melon, scoop out the seeds and cut away the rind. Slice as thinly as possible (a mandoline, if you are lucky enough to have one, would be just the ticket), into long flat ribbons. Lay the prosciutto or pancetta in a nonstick pan and turn the heat on to medium. Cook, flipping once, until the fat is rendered out and the prosciutto is crispy (watch it carefully as it easily burns). Set aside to drain on paper towels. Mix together the vinaigrette ingredients. 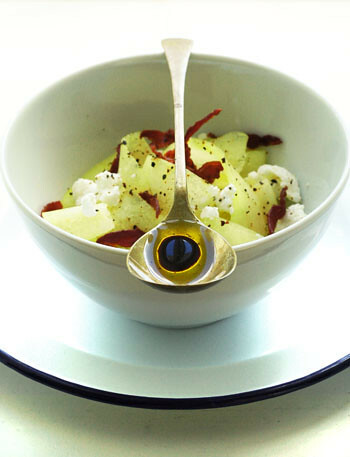 Arrange the melon on plates, crumble the goat cheese and prosciutto over the top, and drizzle with the vinaigrette. Serve immediately. I’ll have to admit that my favourite way of having my prosciutto (if it’s the good stuff) is to savour it on its own because it’s so hard to get it (meaning not the pre-sliced, pre-packaged supermarket stuff) here in Singapore. But your beautiful photograph makes this recipe utterly enticing. What a beautiful photo and delicious refreshing dish. I’m gonna open up a packet of the prosciutto in my fridge and eat this asap! Melissa,That’s a marvelous idea — the goat cheese in particular. Great looking salad! I recently tried another salad you have posted here: the Grapefruit and Avocado Salad (but I had it with ginger steamed fish, was too lazy to do the fingers) and I loved it! Tried it with mango too, as you suggested. Could not decide which one I liked the best. The grapefruit one was refreshing and the mango one sweet and smooth. Liked it both ways. Thanx a lot for posting it. Hi Michele – It must be the spies I sent over to Heidelberg to monitor your culinary undertakings. Haven’t you noticed that webcam in your garlic press? ;)Hi Chubby Hubby – After chocolate gelato, this is just the ticket!Hi Kevin – Thanks — I can’t take all the credit, but since you like the goat cheese (and there isn’t anyone else around to take it) I will anyway! :)Hi unknown – I’m so glad it worked out for you, thanks for letting me know! I still haven’t tried that salad with mango, but it’s interesting that you found them equally good. Maybe I’ll have to try both grapefruit and mango at the same time! that looks divine. and i hate melon! i do try it at least once a year to see if i still hate it – i think this is going to be my attempt to reconcile with melon yet again. but even if my tastebuds can’t appreciate it, my eyeballs (i love the eye of sauron) certainly can! Your site is improving in every way. Hi Melissa,We’ve bought some melon and will be serving friends the last of my stash of San Daniele Prosciutto with it tonight.Oh, and I posted a pix of the yummy chocolate gelato. Thanks again for that post. I’ve been enjoying eating it these past few days. Melissa, truly a salad suited for this weather! I am with you and Michele – pork+cheese+fruit= bliss! Especially as melons are so honey sweet right now, I cannot help but run to the store for some prosciutto this afternoon! Hi Chef – Thanks!Hi Chubby Hubby – I’m so glad the gelato was a hit and I love your photo of it!Hi Tara – Welcome to the club! All this talk about meat and cheese and fruit is making me eye my beloved Crazy Water Pickled Lemons again – there are two recipes I’ve been dying to make, a roast pork with feta, spinach and cardamom-spiced oranges, and a roast lamb with figs, goat cheese and walnuts. The only problem is which one to try first…? I vote roast lamb with figs, goat cheese and walnuts, just because I’ve been obsessed with figs and goat cheese (blame Michele). You must post as to which you try out – I’m salivating over here, and lunch is still 40 minutes away! Gorgeous picture, beautiful and fun post… and the dish sounds divine!